Sixth-graders at Rochester City School #17 learned about home safety and practiced their presentation and leadership skills through a recent series of Peer to Peer Home Safety Trainings through a grant to Prevention 1st from the John Wegman Fund of the Rochester Area Community Foundation. 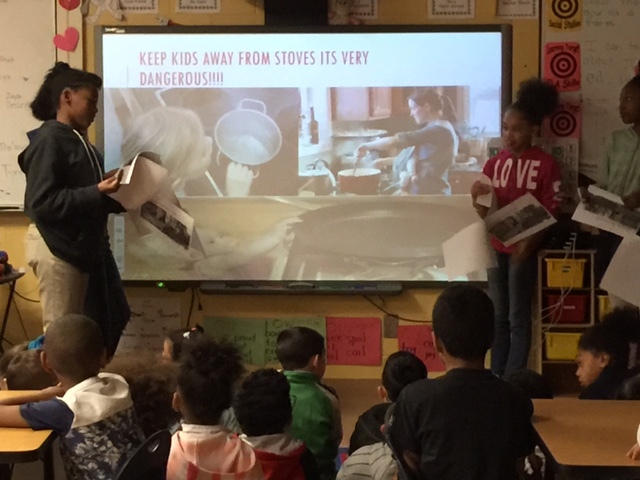 In these workshops, students typically learn about such safety topics as fire and burns, smoke alarms and exit plans, household hazards, kitchen safety, and poison prevention, which they then teach to their schoolmates. For this training, the school’s principal asked for a presentation on one particular aspect of poison prevention–exposure to lead. Two students whose lives had been affected by lead poisoning took on the topic, telling their own stories and teaching schoolmates how to help keep themselves, younger siblings and their families safer. Learn more about lead poisoning prevention in this article by our training partner Community Health Strategies. Learn more about Prevention 1st‘s Peer to Peer Home Safety Training.